In present days, women of Pakistan are showing great enthusiasm towards sports and their interest is also increasing day by day. Female participation in recent sports activities has been groomed dramatically than ever before. This change has been reflected by the various approaches which were used to promote sports and other activities in Pakistan. 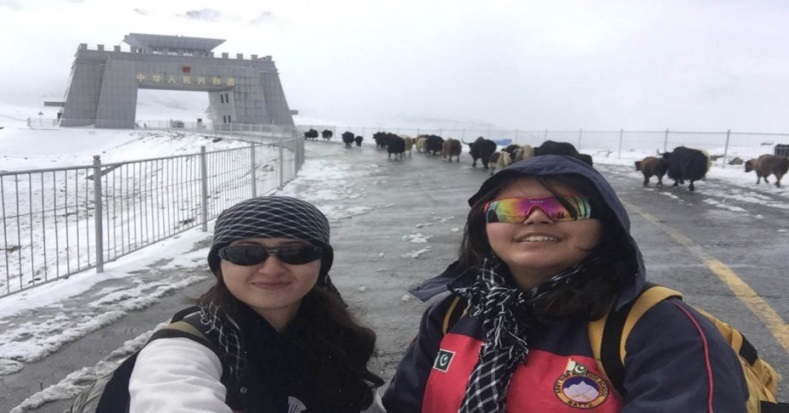 Similar mission and dedication is taken by two young sports loving girl’s Guliafshan and Samar who aimed to promote sports and tourism in Pakistan. Being sports geeks they always desired to do some exceptional work which may influence the youth to participate in sports activities without any social barriers or restrictions. So, they set cycling as a tool to promote gender equity and empower youth especially women. To execute this idea they decided to plan some tours and reach some specific destinations all alone on cycle to show that Pakistan is a safe and peaceful country. Initially they begin their ride from Rawalpindi to Abbottabad. This mini tour increased their confidence and determination, on the basis of this short tour they decided their main target. They planned to reach Khunjerab (China border) on cycle. The starting and ending point of this ride was Islamabad Sports Complex and their route was from Abbottabad to Mansehra and onwards to Hunza and Khunjerab. 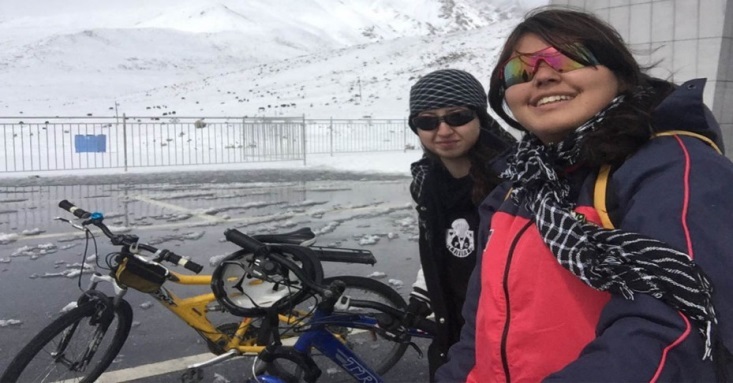 Along with the core vision, commitment and self-confidence these two girls started their journey on cycles all alone and succeeded to cover approximately 1000 kilometers and 4693 meters of height in just 9 days. They also faced some hurdles as the journey was not as easy as it may seem. They encountered some difficulties due to low temperature (-5 degrees) and going through under construction roads from Batgram to Chilaas made their journey even more challenging. During their cycling tour they also recorded their messages, shared their experiences and ideas. They also have conducted several interviews of the local people. Guliafshan and Samar has set an example and proved that with determination and dedication you can achieve even the impossible. They have reflected a Nobel message to the whole world that Pakistan is a safe and secure place where two girls can ride alone for 10 days outside of their homes without any fear. We wanted to promote tourism and sports in Pakistan and specially the female participation in it.So we set a high target for ourselves to become an example for others. We want that people should trust Pakistan, promote its culture and sports and show the world that we are positive people. The valuable contribution of Guliafshan and Samar can make a significant impact to promote tourism in Pakistan. Furthermore, promotion of women sports will give our women the strength to come forward and show their ability. 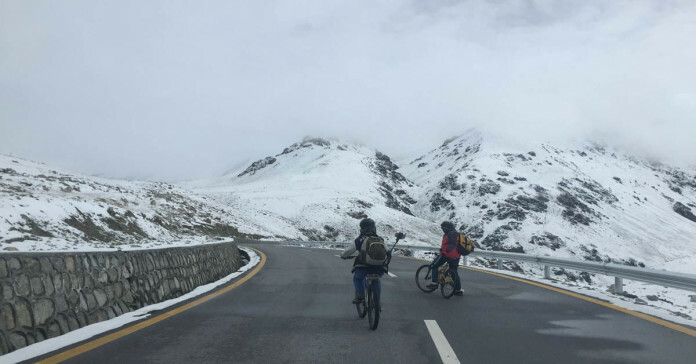 We cycled from Islamabad to Khunjerab pass border of Pakistan and China and then back to Islamabad in 9 days. When we told our family about our trip, our siblings started laughing and called us crazy. Everyone mocked us but the hardest part was getting permission from our mothers and assuring them of our safety. It took 3 months for them to say yes! Before starting the trip, we learnt martial arts, first aid training and how to fix punctures. On the trip, we were mocked by many people in Punjab so we were scared of the treatment we might get in other areas. To our surprise, we were welcomed warmly everywhere we went. People encouraged us and were excited and happy for us. It was the best experience of our lives. No female has ever done this type of expedition before in Pakistan. The reason behind it was to show the world that Pakistani girls are not weak. We wanted to break stereotypes and set an adventurous example for other females to let go of their fears and doubts. We wish to inspire females to join sports and promote tourism by showing that it’s quite safe. We thought cycling is the best way to travel and explore the country and the best tool we have to quench our thirst for adventure and stay healthy at the same time. Our message for everyone and especially for females is that champions are those who make their own legacy and illuminate their country’s name with their achievements. Choose who you want to be and take risks to become that person!